Speedway 2 gallon Twin Tank Air Compressor is a low profile stable design on rooftops or when transporting, which makes it the perfect portable compressor. The twin tanks are oil free. 7 AMP, 1/3 HP with a max PSI of 100. Also, CFM: 1.0 @ 40 PSI and .5 @ 90 PSI. Quiet operation and lightweight in design. 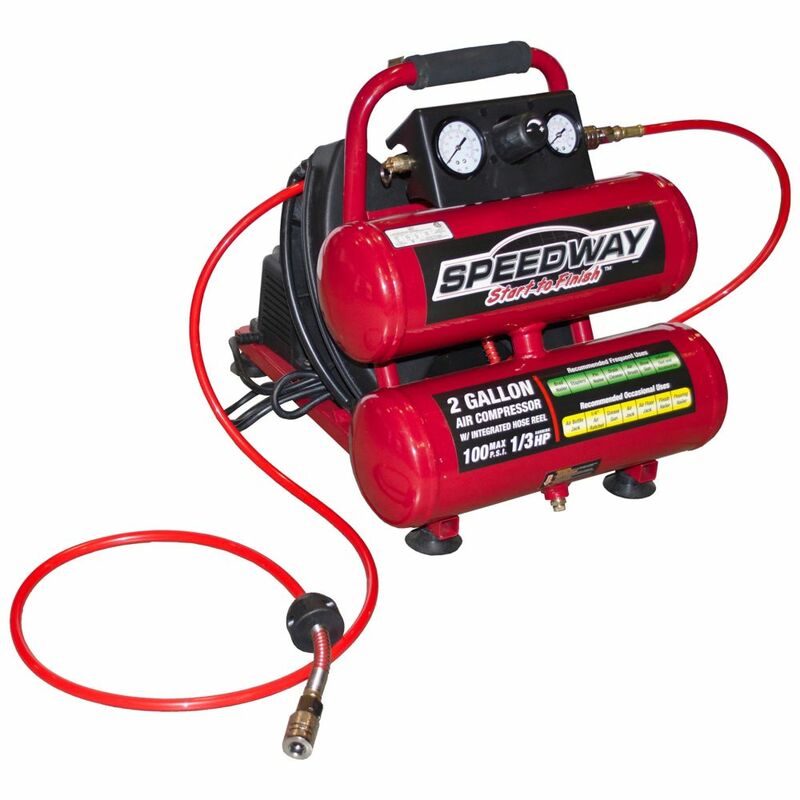 Speedway 2 Gallon twin Stack w/ 25' 1/4" PU Auto Rewind Hose Speedway 2 gallon Twin Tank Air Compressor is a low profile stable design on rooftops or when transporting, which makes it the perfect portable compressor. The twin tanks are oil free. 7 AMP, 1/3 HP with a max PSI of 100. Also, CFM: 1.0 @ 40 PSI and .5 @ 90 PSI. Quiet operation and lightweight in design. Speedway 2 Gallon twin Stack w/ 25' 1/4" PU Auto Rewind Hose is rated 3.3 out of 5 by 14. Rated 5 out of 5 by Connie from Compact and easy to use.... Compact and easy to use. Rated 2 out of 5 by Scott from Weak PSI. In order to build enough pressure, I had... Weak PSI. In order to build enough pressure, I had to turn the right dial to off and let it run to get PSI over 40 PSI in the tank. To inflate a car tire, it took several times. Rated 1 out of 5 by Davea from First time I used it the supply line from the compressor to the storage tank blew out. Returned ... First time I used it the supply line from the compressor to the storage tank blew out. Returned it to store. No similar products in stoc so replaced it with another. Too bad cause I really liked the retractable hose idea. Rated 4 out of 5 by RodgerDodger from This compressor met all my expectations. It gets the job done. I really like the hose reel whic... This compressor met all my expectations. It gets the job done. I really like the hose reel which ratchets and rewinds the hose with almost no effort. I'm impressed with what this product provides for such a good bargain price. If you need a compressor for occasional small jobs, then this is the compressor for you. Rated 1 out of 5 by Greg from This is one of the few times I've ever been disappointed in a product! My thoughts are this compr... This is one of the few times I've ever been disappointed in a product! My thoughts are this compressor would be hard pressed to air up a balloon, much less an automobile tire!